I think it's clear from my past posts that I love cartoons and animation. I fawn over the works of Pixar, Disney, Studio Ghibli, and even DreamWorks at times. And if it's one thing that DC Comics and Warner Bros. can do, it's create quality animation (especially since their live-action movies keep failing). However, part of the Time-Warner family of animation includes a prominent and pop culturally important studio that I could never find myself caring much about, and that's Hanna-Barbera. Sure, I grew up with reruns of The Jetsons and Scooby-Doo, and I've seen their other shows become "reimagined" by Adult Swim, such as cult classics Sealab 2021, Space Ghost Coast to Coast, and Harvey Birdman, Attorney at Law. But Hanna-Barbera wasn't known for pushing the boundaries of animation or storytelling. They pumped out cheap and digestible tripe that had invaded the cultural consciousness through sheer overwhelming numbers. My point being, nostalgia alone was not enough for me to show an interest in a comic whose subject matter reminded me of chewable vitamins, breakfast cereals, and Winston cigarettes. 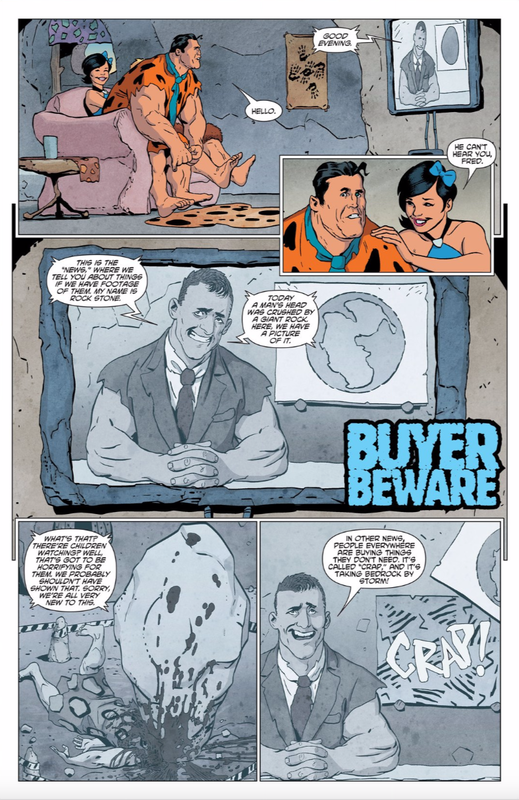 And then a couple of months ago, users on the r/comicbooks subreddit started posting a couple of pages of The Flintstones comic book, released by DC Comics as part of their "Hanna-Barbera Beyond" universe. "Beyond" is their ongoing attempt to reboot or reuse old properties (like Wacky Racers and Jonny Quest) into newer, modern, and in some cases "grim and grittier" interpretations. But what I saw on Reddit was something I didn't expect, and I was instantly intrigued. I waited for the first collected trade paperback to be released so that I could review for you what is probably one of the most poignant satires available in mainstream comics today. On its surface, The Flintstones is the same as its cartoon counterpoint, in that it tells the story of caveman Fred Flintstone and his family living in the prehistoric "modern" town of Bedrock. There's no laugh track this time around, but there are dinosaurs mixing with people and talking animals acting as appliances. There are a million puns relating to rocks or other stone aged concepts (like making calls on a "shellphone!" Get it?! SHELL-PHONE! Hahahaha- Now how the hell does that thing work without satellites?). And of course, there are the weekly support meetings for veterans of a paleolithic war against the Tree People that have left many of Bedrock's fighting men unemployed, broken, or suicidal. Oh wait, was that not in the cartoon? I'm pretty sure the TV show also didn't deal with the following issues: consumerism, organized religion, fate, art and art criticism, cultural appropriation, genocide, marriage equality, love and relationships, racism, democracy, Unitarians... all of these and more make appearances in The Flintstones. The comic tears huge chunks out of modern culture, highlighting just how appalling, ridiculous, or deluded we are as a society, and it does so by depicting our foibles in people who are still new to this whole "civilization" thing, to the point where it's more of a fad. The comic doesn't always attack things straight on, oftentimes dropping subtle comments or visual hints. At one point, Fred participates in a scam to sell vitamins, and it ends with him raving about how useless they are (which in this context is fantastic). When Dino is finally introduced, he's clearly a pet in a world where animals are appliances. Yet the appliances essentially refer to him as an Uncle Tom (what???). And hidden in the background is the fact that the school that Pebbles and Bamm-Bamm attend is "Home to the Fighting Tree-People," the people who were wiped out during the aforementioned war. Also like the cartoon, there's no real character development or overarching plot, nor are the subjects explored that deeply. At the most the stories are slice-of-life events (elections, couples retreats, shopping sprees), and even at their highest stakes (alien "invasion," possible armageddon), the characters in the world sort of shrug their shoulders and move on with the status quo like an old TV sitcom, which I guess is the point. The Flintstones is a caustic and nihilistic satire of modern civilization that offers little in the way of hope and reprieve. 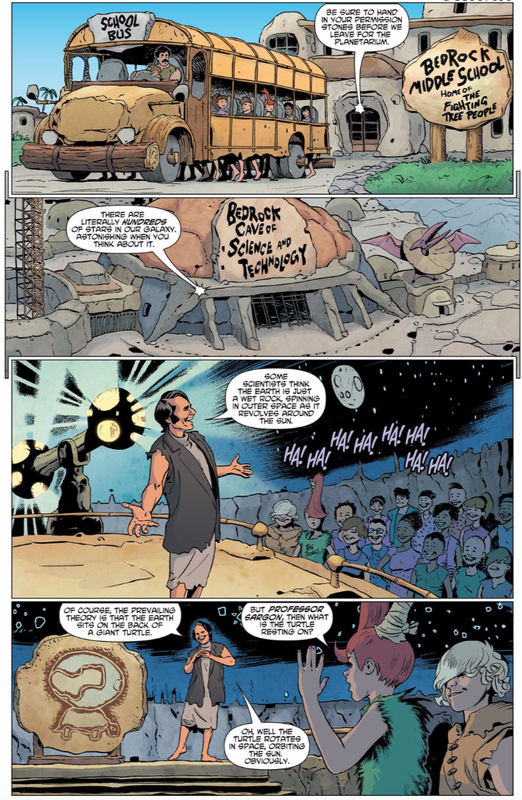 The comic uses its humor to showcase brilliant observations about the modern human condition (and again, this is the flippin' Flintstones we're talking about here). At times, this book gets downright depressing. But like all feelings, it doesn't last forever, and even if the character's illusions are shattered or questioned, the characters return to their lives like normal, though whether it's with denial or acceptance is hard to say. With all of this in mind, did I even enjoy it? Actually yes, I did, and quite a bit. Russell's writing and observations are clever and well designed, and the stories each issue tells are well developed and fun to read. He struggles a bit giving each character its own distinct voice, but overall this is some high concept material. Pugh's art compliments everything incredibly well, giving the men beefy-armed caveman designs and the women bizarre hairstyles, but mixing it with realistic faces and facial expressions. And even though many of the comic's observations are soul-crushingly depressing, that only made me enjoy it more. Also? It's absolutely hilarious. (One scene of a chimpanzee being shot into the sky on a rocket ship of wood and stone while someone shouts "SCIENCE!" is probably my favorite image in the world right now.) The Flintstones represents a world I want to live in—And no, not a prehistoric one where people are abducted by pterodactyls, although I admit having a pet dinosaur would be awesome obviously. Instead, it's a world where we acknowledge the illusions and intangible concepts that keep us "civilized," if only to address the absurdities and try to change things for the better. The world of The Flintstones is a brightly-colored one, but under that lies a current of darkness that threatens to send everyone back to their hunter-gatherer tribes. I'm not sure if I'd recommend this comic to everyone, but it is without a doubt one of the most thought-provoking and refreshing satires I have read in a long time. If the idea of reading that through the lens of a modern stone-age family appeals to you, then give it a shot.